Ujawniono efekt karty, którą Yusei pokonał Z-ONE'a! 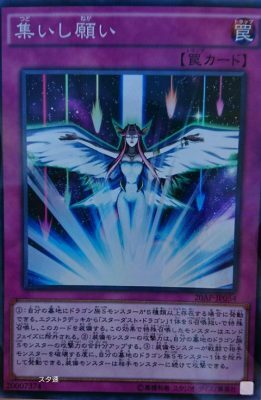 (1) If 5 or more Dragon-Type Synchro Monsters with different names are in your Graveyard: Special Summon 1 “Stardust Dragon” from your Extra Deck, but banish it during the End Phase, and if you Summon it this way, equip it with this card (this Special Summon is treated as a Synchro Summon). (2) The equipped monster gains ATK equal to the total ATK of all Dragon-Type Synchro Monsters in your Graveyard. (3) Each time the equipped monster destroys an opponent’s monster by battle: You can banish 1 Dragon-Type Synchro Monster from your Graveyard; the equipped monster can attack an opponent’s monster again in a row.